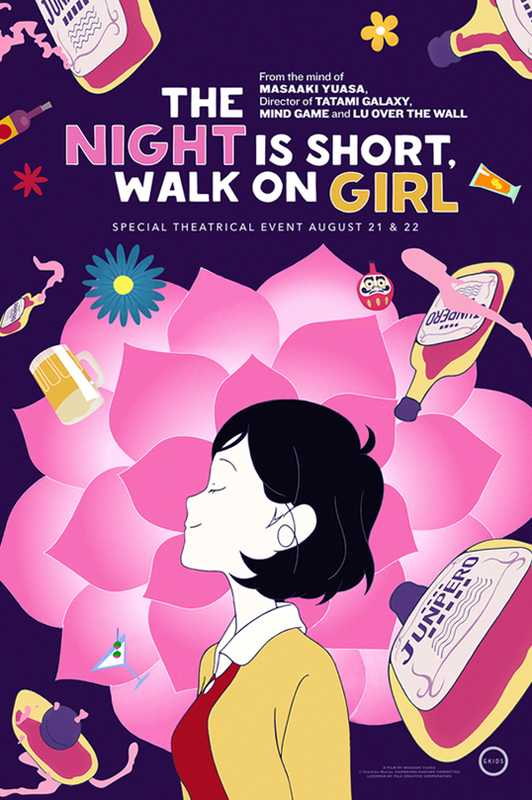 The year of Masaaki Yuasa (that has already brought us Devilman Crybaby and the US release of Lu Over The Wall) continues as GKIDS Films bring The Night Is Short, Walk On Girl to US screens starting with a Fathom Event screening on August 21 and 22. A surreal comedy that follows The Girl With The Black Hair on one epic night in Kyoto- be sure to check out our review here. Once again we're teaming up with GKIDS to offer 2 tickets to see it at a screening of your choice. But that's not all- the prize also inclues a prize pack that consists of an exclusive shotglass, coaster and a mini-poster. The giveaway runs from midnight on August 6 to 11.59 on August 13, (all times EDT). US entries only. All you have to do is enter using the widget below, or via this link. If you're not lucky enough to win, get your tickets here. From the visionary mind of director Masaaki Yuasa (Mind Game, Adventure Time’s “Food Chain”) comes The Night is Short, Walk on Girl, a comedy about one epic night in Kyoto. As a group of teens go out for a night on the town, a sophomore known only as “The Girl with Black Hair” experiences a series of surreal encounters with the local nightlife... all the while unaware of the romantic longings of Senpai, a fellow student who has been creating increasingly fantastic and contrived reasons to run into her, in an effort to win her heart.